Anne Marie Francis, 22, was released from her mortal bonds and was returned to her heavenly father on Saturday, March 9, 2013. She was surrounded by her loving family and friends. Her smiles and laughter will always be missed and remembered by all. 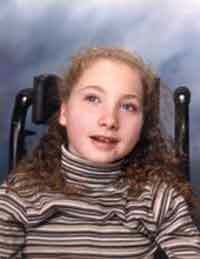 Annie loved country music, going to movies, riding lawnmowers and horses. She loved watching football with her crazy, loud mother. She also liked going to watch her brother in his various sports, especially rodeo! Annie is survived by her mother, Heather Gonzalez of Gooding Idaho; dad, Terance Kulhanek of Gooding; brother, Iain Gonzalez of Gooding; grandparents, Peggy and Jose Guerecaechevarria of Hagerman, Idaho, and Don and Audrey Davis of Horseshoe Bend, Idaho; great-grandmother, Maria Pilar Larrea of the Basque country; aunt, Megan Davis of Bellevue, Idaho, and uncles, Donavun Davis of Nampa, Idaho, and Nathaniel and Deanna Davis of Kuna, Idaho; multiple cousins; and Regina Davis “Momma No. 2” of Gooding. Annie also has extended family living in Idaho, Scotland and the Basque country. A special thank you to Regina Davis and Ruth Fraga for the many years of love and care of Annie and me. Memorial contributions may be made to the International Rett Syndrome Foundation, Box 706143, Cincinnati, OH 45270; or to the Gooding Basque Association, Box 517, Gooding, ID 83330. A celebration of life for Annie will be celebrated at 11 a.m. on Saturday, March 23, at the Gooding Basque Association, 285 Euskadi Lane in Gooding. Cremation arrangements and funeral services are under the care and direction of Demaray Funeral Service-Gooding Chapel. Condolences may be shared with the family by visiting the obituary link at www.demarayfuneralservice.com.